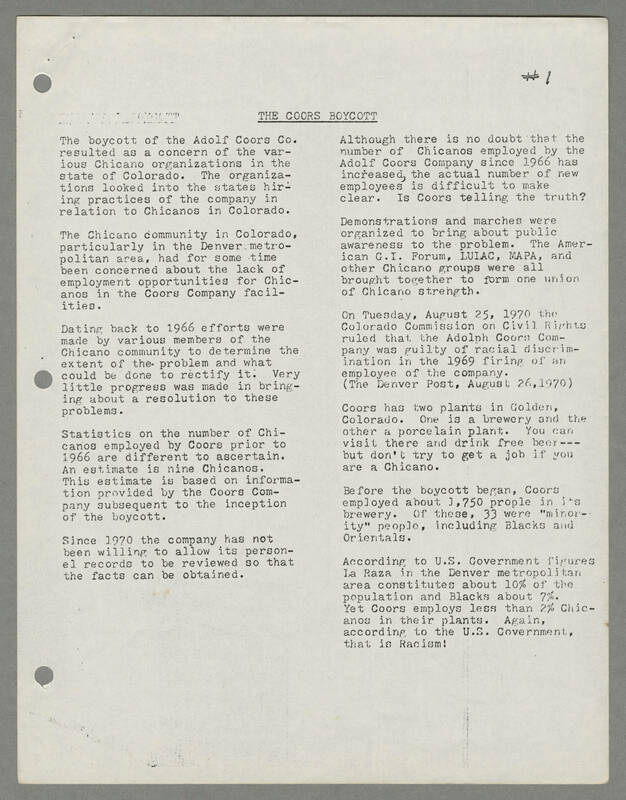 #1 [[underline]]THE COORS BOYCOTT[[end underline]] The boycott of the Adolf Coors Co. resulted as a concern of the various Chicano organizations in the state of Colorado. The organizations looked into the states hiring practices of the company in relation to Chicanos in Colorado. The Chicano community in Colorado, particularly in the Denver metropolitan area, had for some time been concerned about the lack of employment opportunities for Chicanos in the Coors Company facilities. Dating back to 1966 efforts were made by various members of the Chicano community to determine the extent of the problem and what could be done to rectify it. Very little progress was made in bringing about a resolution to these problems. Statistics on the number of Chicanos employed by Coors prior to 1966 are different to ascertain. An estimate i nine Chicanos. This estimate is based on information provided by the Coors Company subsequent to the inception of the boycott. Since 1970 the company has not been willing to allow its personel records to be reviewed so that the facts can be obtained. Although there is no doubt that the number of Chicanos employed by the Adolf Coors Company since 1966 has increased, the actual number of new employees is difficult to make clear. Is Coors telling the truth? Demonstrations and marches were organized to bring about public awareness to the problem. The American F.I. Forum, LULAC, MAPA, and other Chicano groups were all brought together to form one union of Chicano strength. On Tuesday, August 25, 1970 the Colorado Commission on Civil Rights ruled that the Adolph Coors Company was guilty of racial discrimination in the 1969 firing of an employee of the company. (The Denver Post, August 26, 1970) Coors has two plants in Golden, Colorado. One is a brewery and the other a porcelain plant. You can visit there and drink free beer---but don't try to get a job if you are a Chicano. Before the boycott began, Coors employed about 1,750 prople in its brewery. Of these, 33 were "minority" people, including Blacks and Orientals. According to U.S. Government figures La Raza in the Denver metropolitan area constitutes about 10% of the population and Blacks about 7%. Yet Coors employs less than 2% Chicanos in their plants. Again, according to the U.S. Government, that is Racism!